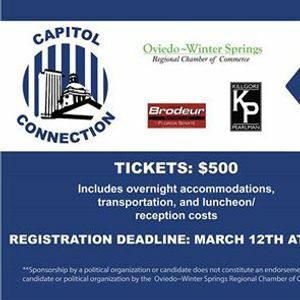 The 2019 Capitol Connection Trip is presented by Jason Brodeur for State Senate 2020 and Killgore Pearlman Semanie Denius Squires, P.A. 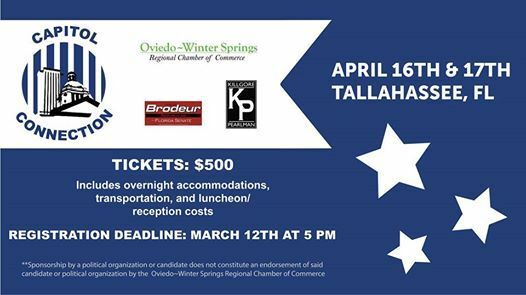 The Oviedo-Winter Springs Regional Chamber is Tallahassee-Bound! Seats are limited, reserve now! Mixer Reception with Lakeland Chamber & other Central Florida regional chambers! Transportation: Ride in comfort on a charter bus! ​*Already going to be in Tallahassee? Contact Halie DeLoach at 407-278-4872 for further information.